Machado made his MLB debut in August 2012. In 2013, Machado earned a spot on the American League (AL) All-Star team on his way to leading the league in doubles with 51. He was also recognized as one of the best fielders in the game, winning a Gold Glove Award. Machado won his second Gold Glove in 2015, and made the All-Star Game in 2015 and 2016. His defensive prowess has earned him frequent comparisons to former Orioles third baseman and Hall of Famer Brooks Robinson. In 2018, Manchado was hitting .313 with 21 home runs and 60 RBIs, and made his fourth All-Star appearance. An impending free agent, he was then traded to the Los Angeles Dodgers the day after the game and helped the team make the World Series. Manchado struggled in the series, batting just .182 with no extra base hits as the Dodgers fell to the Boston Red Sox. That offseason, Manchado signed a signed a 10-year, $300 million contract with the Padres, the richest contract in the history of North American sports at the time. Machado was born and raised in Hialeah, Florida. He was raised by his mother, Rosa Machado, his grandfather, Francisco Nunez, and his uncle, Geovanny Brito. He is of Dominican heritage. Machado grew up in Hialeah alongside Chicago Cubs outfielder Albert Almora, and while they are not related by blood they consider each other to be cousins. Machado attended Brito Miami Private School in Miami, and committed to attend Florida International University. Machado was selected third overall in the 2010 Major League Baseball draft by the Baltimore Orioles. He was the second high school player drafted, as well as the second position player. He signed a $5.25 million contract, just minutes before the deadline on August 16, 2010. While his agent Scott Boras was negotiating his contract, Machado spent the summer of 2010 playing for USA Baseball's 18-and-under national team. Machado was introduced by the Orioles in mid-September when the Orioles hosted the New York Yankees. On August 22, Machado reported to the Orioles minor league complex to join the Gulf Coast League Orioles. Machado made his professional debut with the Gulf Coast League Orioles on August 27, 2010, where he went 0-for-3 with a strikeout. He played as the designated hitter. Machado hit his first professional home run in his second game with the Orioles. Machado made his debut with the Low-A Aberdeen IronBirds of the New York–Penn League on August 30, 2010 where he went 1-for-3 with a single. He played shortstop, instead of being the DH, as he did with the Orioles, and he was pulled after the fifth inning. Machado began the 2011 season with the Delmarva Shorebirds, playing shortstop. He hit five home runs before May 1, and was named the South Atlantic League player of the week for April 25 – May 1. After missing several weeks with a knee injury, he returned to play 10 more games and appear in the SAL All-Star Game on June 21, 2011. After the game, he was promoted to the High-A Frederick Keys. He was named to appear in the 2012 All-Star Futures Game. The Orioles promoted Machado to the major leagues from the Double-A Bowie Baysox on August 9, against the Kansas City Royals. He started at third base, as the team already had J. J. Hardy at shortstop. The following day, against the same opponent, he hit his first and second career home runs, making him the youngest Oriole and 12th youngest player in major league history to have a multi-homer game. The two home runs were both off of former number-one overall draft choice Luke Hochevar. He then hit his third career home run on August 12 off of Bruce Chen. In Game 3 of the 2012 ALDS, Machado hit his first career postseason home run. The Orioles lost the division series to the New York Yankees in five games. Machado finished his rookie season having played in all 51 of the remaining Oriole games. In 202 plate appearances, he hit .262 with eight doubles, three triples, 7 home runs, 26 RBI, and two steals in as many attempts. He collected 50 hits and scored 24 runs. Machado had three hits on May 27, giving him 40 multi-hit games in his career, tying Ty Cobb for the major league record for the most multi-hit games before age 21 in history; on May 30, he went 2-for-3 to break Cobb's record. Machado's 44 hits in May 2013 were the second-most in a month by a player under 21 behind Mickey Mantle's 46 in July 1952. At the end of May, Machado led the major leagues with 25 doubles and was tied for the MLB lead in hits (79) with reigning AL MVP Miguel Cabrera. Exactly halfway through the season, Machado got his 37th double, putting him on pace to break the single season record (67) in his first full season. On June 27, 2013, Machado argued a correctly ruled strike-three call, leading to his first career MLB ejection. Coincidentally, this was also the first career MLB ejection for the umpire who threw him out, Will Little. An All-Star, he slashed .310/.337/.470 with 7 home runs, 45 RBI, and 39 doubles in the first half. Machado suffered a left knee injury when reaching first base after a hit on September 23, 2013. Machado received immediate medical attention and left the game on a stretcher. The injury also ended his consecutive games played streak at 207. 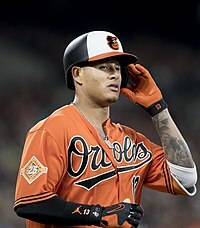 Machado was ruled out for the 2013 season. He finished the year hitting .283/.314/.432 with 14 HR, 71 RBI and 51 2B. He led the American League in doubles, at-bats (667) and fielding percentage at third base (.973). On October 10, Machado opted to have reconstructive surgery performed on his knee to reduce the chance of future dislocations. The surgery would sideline him for 4–6 months, but he was still expected to return sometime around Opening Day. On October 29, Machado won the Gold Glove Award at third base, the first by an Oriole third baseman since Brooks Robinson's 16-year run from 1960–1975. On November 8 of the same year, Machado won the AL Platinum Glove Award. On April 29, 2014, he was removed from the disabled list after knee surgery recovery and on May 1, he was greeted by a standing ovation from the hometown Baltimore fans prior to the first game of a doubleheader sweep against the Pittsburgh Pirates. On June 1, 2014, Machado hit his 1st career grand slam in a 9-4 Orioles victory over the Houston Astros. On June 7, 2014, Machado was running to third base on a ground ball when he was tagged by Oakland Athletics third baseman Josh Donaldson. This incident led to a bench clearing brawl. On June 8, 2014, Machado struck Athletics catcher Derek Norris with his bat during the follow-through of his swing. Norris was taken out of the game as a result. In the 8th inning, Machado threw his bat in the direction of third base in response to two consecutive inside pitches thrown by Oakland reliever Fernando Abad. The umpires determined that the bat was meant for Abad, and both Abad and Machado were ejected from the game. The next day, Machado issued a formal apology to his teammates and Oakland. On June 10, Machado was fined and suspended five games for his actions. After losing an appeal, Machado began serving his suspension on June 30. On August 11, Machado injured his right knee while batting in a home game against the New York Yankees. Although originally describing it as a sprain, ten days later the Orioles announced that the injury required surgery and that Machado was out for the season. Machado started the 2015 season healthy. By June 18, he had already tied his career high for home runs, which was 14 in 2013. Machado was named to the American League roster for the 2015 MLB All-Star Game and was selected as a participant for the 2015 Home Run Derby. On October 1, Machado became the seventh Oriole to have 20 home runs and 20 stolen bases in a season. Machado was the only major league player to appear in all 162 games in 2015. He batted .286 after collecting 181 hits, along with 35 home runs, 86 RBIs, and 20 steals. He led the American League in power-speed number (25.5). He made 21 errors, fifth-most of all players in the AL and second-most of all AL third basemen. He finished fourth in the American League in MVP voting and won his second career Rawlings Gold Glove for his outstanding defensive play at third. Machado set career-high numbers in games played (162), runs scored, home runs, RBIs, walks, steals, batting average, on-base percentage, slugging percentage, on-base plus slugging, and Wins Above Replacement. Machado hit safely in the first ten games of the season. On April 23, Machado extended his hit streak to 16 games, a new career best. Machado's hit streak peaked at 16 games before ending. During the hot streak, Machado went 27-for-68 while slashing .397/.446/.779, while hitting six home runs and driving in 11. On April 28, he hit his second career grand slam and drove in a career-high five runs in a 10-2 victory over the Chicago White Sox. Machado was named AL Player of the Month for April, after going 33-for-96 (.344), hitting ten doubles, seven home runs, driving in 17 runs, while slugging .667 with a .394 on-base percentage. Machado set a new career-high for RBIs on May 8 against the A's, when he hit two home runs (including his second grand slam of the year), while driving in six in an 11-3 victory. On June 7, Machado charged the mound against Kansas City Royals' pitcher Yordano Ventura, punching Ventura in the face and igniting a benches-clearing brawl. Machado charged the mound after Ventura hit Machado with a first-pitch, 99-mph fastball in the back. Both players were ejected. On June 9, Machado received a four-game suspension for the incident, which he was initially going to appeal, in the end deciding not to. The suspension was served from June 19–22, 2016. In his first game back, Machado went 2-for-4 and hit a home run. Machado slashed .318/.375/.569 with a .944 OPS, 19 home runs and 53 RBIs before the All-Star break. He collected 109 hits and was named to his third career All-Star game, and his first ASG start. Manny went 0-for-3 in the ASG. He was the second player in MLB history to hit a home run in each of the first three innings of a game in a 10–2 victory over the White Sox at U.S. Cellular Field on August 7. The feat was previously accomplished by the White Sox's Carl Reynolds in a 15–4 win which was the nightcap of a doubleheader at Yankee Stadium on July 2, 1930. Machado was actually the first to hit all three that cleared the fence; two of Reynolds' were inside the park. The three homers within the first three innings of a contest were achieved for the first time since the Seattle Mariners' Mike Cameron did it in the same ballpark in a 15–4 win on May 2, 2002. Machado was also the ninth player to homer in three consecutive innings at any point during a match and the first Oriole to hit three in a game since Chris Davis in a 9–2 victory over the Pittsburgh Pirates at PNC Park on May 20, 2014. On August 26, Machado hit his 30 and 31st home runs of the season, becoming the third Oriole on the year to hit 30 home runs (Mark Trumbo & Chris Davis). The three became the first trio of Orioles to hit 30+ homers in a single season. It was also Machado's tenth homer of the month, making him, Trumbo and Davis the first trio of Orioles with 10 or more home runs in a month. On August 30, Machado hit his 100th career home run in a 5-3 win over the Toronto Blue Jays. He hit the homer in his 578th game, making him the third-fastest Oriole to 100 homers. He also became the youngest Oriole to hit his 100th home run (24 years, 55 days). Machado hit his MLB-leading third grand slam of the season on September 6 in an 11-2 win over the Rays. With the homer, he set a new career-high in the RBI column, surpassing his 86 from the previous season. It was also his 102nd career homer, tying him with teammate JJ Hardy for 25th on the all-time Orioles home run list. He became the youngest Oriole ever to have three grand slams in the same season. He also tied the MLB record for most grand slams in a season age 24 or younger. Manny had five RBIs in the game, and joined the likes of Miguel Tejada and Jim Gentile as the only Orioles players with four five-RBI games in the same season. On September 18, Machado surpassed his previous season high in home runs, hitting his 36th, against the Tampa Bay Rays. Machado ended his regular season having played in 157 games, slashing .294/.343/.533 while hitting a career-high 37 home runs and driving in a career-high 96 runs. He recorded career highs in runs scored, strikeouts, batting average, slugging percentage, OPS, and total bases. On January 13, Machado and the Orioles avoided arbitration by agreeing to a $11.5 million deal for the 2017 season. On April 16, Machado hit his second home run of the season and moved into a tie for 26th on the Orioles all-time list with 107. On April 28, 2017, Machado hit a home run off of CC Sabathia that bounced off the facade of the deck above Monument Park in straightaway center field, measuring 470 feet. Although the Orioles led 9-1, they lost 11-14 in 10 innings. On May 10, Machado became the first Oriole in franchise history to collect 270 extra-base hits before turning 25 – only the 30th player in MLB history to do so. On August 7, Machado hit a game-winning grand slam against the Angels in the seventh inning. A week later he hit his second grand slam of the season. Four days later, Machado hit a walk-off grand slam against the Angels, his third home run of the game and his seventh career grand slam. It was also his second career three-homer game, joining Chris Davis, Goose Goslin, Eddie Murray and Boog Powell as the only Orioles in franchise history with multiple three-homer games. He also became the first Orioles player to record multiple 3-grand slam seasons, and just the second player in recorded MLB history with back-to-back seasons of three or more grand slams. On August 23, he hit a walk-off solo home run, the fourth of his career. In all, Machado hit three walk-off home runs in 2017, the most by any MLB player that season. Machado won AL Player of the Month in August, slashing .341/.348/.690 with an OPS of 1.038. He hit 12 homers, six doubles and one triple, while driving in 35 runs and scoring 23 times. Despite a poor first half, Machado finished his season strong in the second half, ending the year having slashed .259/.310/.471 with 33 doubles, 33 home runs, 95 RBI and nine stolen bases. He made 14 errors, second-most among all AL third basemen. He was also a finalist for Rawlings Gold Glove award, losing out to fellow-AL East third baseman Evan Longoria. For 2018, Machado was moved back to shortstop, his natural position. Batting .313 with 21 home runs and 60 RBIs, Machado was named the starting shortstop for the 2018 MLB All-Star Game. On July 18, 2018, Machado was traded to the Los Angeles Dodgers for Yusniel Diaz, Dean Kremer, Rylan Bannon, Breyvic Valera and Zach Pop. Unable to use his No. 13 uniform number in Los Angeles since it was already worn by infielder Max Muncy, Machado chose uniform No. 8 because he was a Kobe Bryant fan growing up. He debuted as a Dodger on July 20 against the Milwaukee Brewers and had two singles and two walks. He recorded his 1,000th career hit on August 9, off of Tyler Anderson of the Colorado Rockies. In 66 games with the Dodgers, Machado finished with a .273 batting average, 13 home runs, and 42 RBI. Overall in 2018, combined with both teams, Machado played 162 games with a .297 average, 35 doubles, 37 home runs, and 103 RBI. After defeating the Rockies 5-2 in a tiebreaker, the Dodgers clinched the NL West pennant. Machado was fined an undisclosed amount for the way he ran into first base in Game 4 of the National League Championship Series against the Brewers. Machado caught the foot of Brewers' first baseman Jesus Aguilar with his own, which prompted the benches to clear. Machado was the final out of the 2018 World Series, striking out against Chris Sale to end game five. He hit just .182 in the series with no extra base hits. Machado signed a 10-year, $300 million contract with the San Diego Padres on February 21, 2019. It was the largest free-agent contract in American sports history until Bryce Harper signed a 13-year, $330 Million contract with the Philadelphia Phillies two weeks later. Machado played for the Dominican Republic in the 2017 World Baseball Classic, where he was nicknamed "El Ministro de la Defensa" for his defense. He was named the most valuable player in the first round's Pool C, in which he batted .357. The Dominican team lost to the US in Pool F, failing to advance to the championship round. Machado slashed .269/.321/.462 in six games while hitting a pair of doubles and a home run. “There was no way I could pass on representing the Dominican Republic in the WBC. It’s in my blood. I’m doing it for my mother. I’m doing it for my uncle. I’m doing it for everybody who has supported me in my career. And most of all, I’m doing it for my grandfather. 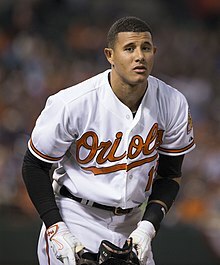 Keith Law, a writer for ESPN.com and the lead baseball analyst for Scouts, Inc., said in 2010 that if Machado stayed at shortstop, "you have a potential All-Star offensively who is no worse than average with the glove". In the middle of his first full MLB season (2013), Fangraphs evaluated Machado as the best third baseman in baseball, by a wide margin. Machado has been compared to New York Yankees third baseman, Alex Rodriguez, whom he considers his mentor. Machado said "it's a great honor" to be compared to Rodriguez, but he doesn't compare himself to anyone. Orioles Hall of Famer Jim Palmer compared Machado to another large-framed shortstop/third baseman: "He reminds me of how I think Cal (Ripken) would have been if he had played third base his entire career." In November 2014, Machado married his longtime girlfriend Yainee Alonso, the sister of Yonder Alonso. He has a dog named Kobe, as he was a huge fan of basketball player Kobe Bryant while growing up. Machado's agent is Dan Lozano. He was represented by Scott Boras at the start of his career. ^ a b Lemire, Joe (June 1, 2010). "After Nationals draft Bryce Harper, Machado, Taillon figure to be next". Sports Illustrated. Archived from the original on November 2, 2012. Retrieved August 17, 2010. ^ a b c Machado, Manny. "Why I'm Playing for the Dominican Republic". The Players' Tribune. Retrieved July 20, 2018. ^ Whitaker, Lang (April 8, 2013). "Manny Being Manny: A GQ+A With Baltimore Orioles 3B Manny Machado". GQ. Archived from the original on April 9, 2013. Retrieved May 17, 2013. ^ Andracki, Tony (August 25, 2014). "Manny Machado says Albert Almora will be 'a great Cub someday'". NBC Sports Chicago. Retrieved February 19, 2019. ^ "O's Land Prep Shortstop Machado at No. 3". Retrieved June 4, 2017. ^ Connolly, Dan (August 17, 2010). "Some more Scott Boras quotes on Machado signing". The Baltimore Sun. Archived from the original on November 9, 2012. Retrieved August 18, 2010. ^ Sobchak, Walter (August 17, 2010). "FIU loses out on former Brito standout Machado, who signs with Orioles". College Sports Nation. Archived from the original on May 3, 2014. Retrieved May 17, 2013. ^ Ghiroli, Brittany (August 16, 2010). "Orioles sign No. 3 overall pick Machado". MLB.com. Archived from the original on November 12, 2012. ^ Connolly, Dan (September 4, 2010). "Starter Tillman aims to stay in majors this time". The Baltimore Sun. Archived from the original on June 10, 2016. Retrieved June 9, 2016. ^ Connolly, Dan (August 18, 2010). "Machado won't be introduced until September; goes to Gulf Coast League on Sunday". The Baltimore Sun. Archived from the original on June 9, 2012. ^ "Manny Machado: O's Machado hitless in pro debut". RotoWorld.com. August 27, 2010. Archived from the original on March 22, 2012. Retrieved August 29, 2010. ^ Fritz, Ron (August 30, 2010). "Machado: I've been waiting for this for a long time". The Baltimore Sun. Archived from the original on June 9, 2012. Retrieved June 9, 2016. ^ Zenitz, Matt (August 31, 2010). "Machado Average in Aberdeen Debut". Press Box. Archived from the original on June 9, 2012. ^ "Machado Named SAL Player of the Week". Delmarva Shorebirds. May 2, 2011. Archived from the original on March 23, 2012. Retrieved May 2, 2011. ^ Hanley, Corey (June 22, 2011). "Manny Machado, Top Baltimore Orioles prospect Manny Machado promoted to Frederick". Bleacher Report. Archived from the original on October 10, 2012. Retrieved June 22, 2011. ^ Jonathan Mayo (June 19, 2012). "Prospects pack rosters for 2012 All-Star Futures Game". MLB.com. Archived from the original on October 16, 2012. Retrieved August 9, 2012. ^ Encina, Eduardo A. (August 9, 2012). "Orioles calling up top position player prospect Manny Machado from Double-A Bowie". The Baltimore Sun. Archived from the original on May 3, 2014. Retrieved August 9, 2012. ^ Townsend, Mark (August 11, 2012). "Manny Machado launches first two career home runs, same fan catches both". Yahoo! Sports. Archived from the original on May 3, 2014. Retrieved August 12, 2012. ^ Encina, Eduardo A. (August 10, 2012). "Manny Machado homers twice in his second game as O's beat Royals". The Baltimore Sun. Archived from the original on May 3, 2014. Retrieved August 11, 2012. ^ "Yanks ride to ALCS behind CC Sabathia's complete game". ESPN. The Associated Press. October 12, 2012. Retrieved June 9, 2016. ^ a b c "Manny Machado Stats, Fantasy & News". Baltimore Orioles. Retrieved June 10, 2016. ^ a b Nando Di Fino (October 25, 2013). "American League Gold Glove finalists announced". CBS Sports. Archived from the original on October 29, 2013. ^ "MLB Ejection 084: Will Little (1; Manny Machado)." Close Call Sports/Umpire Ejection Fantasy League. June 27, 2013. ^ Corcoran, Cliff (September 23, 2013). "Manny Machado suffers major leg injury against Rays". Sports Illustrated. Archived from the original on October 31, 2013. Retrieved September 23, 2013. ^ Jay Jaffe (April 29, 2014). "Manny Machado set to make 2014 debut for Orioles after offseason knee surgery". Sports Illustrated. Archived from the original on May 3, 2014. Retrieved May 3, 2014. ^ Pouliot, Matthew (October 10, 2013). "Manny Machado opts to have surgery on knee ligament". NBC Sports. Archived from the original on October 14, 2013. ^ Mark Townsend (October 29, 2013). "Manny Machado and Andrelton Simmons highlight Rawlings Gold Glove winners". Yahoo! Sports. Archived from the original on November 1, 2013. Retrieved October 30, 2013. ^ Justin McGuire (April 29, 2014). "Manny Machado injury update: Orioles All-Star ready to return". Sporting News. Archived from the original on May 3, 2014. Retrieved May 3, 2014. ^ Ghiroli, Brittany (June 9, 2014). "Machado apologizes, hopes to learn from 'mistake'". MLB.com. Retrieved August 25, 2014. ^ "Orioles Machado suspended for 5 games, appeals". ESPN.com. Associated Press. June 10, 2014. Archived from the original on August 21, 2014. Retrieved June 10, 2014. ^ "Orioles' Machado gets 5-game suspension from MLB". ESPN.com. Associated Press. June 30, 2014. Archived from the original on August 21, 2014. Retrieved July 1, 2014. ^ "Knee surgery once again ends Orioles third baseman Manny Machado's season". Retrieved March 18, 2017. ^ "Machado gets 12 homers & loses, but O's fans win". July 13, 2015. Retrieved March 18, 2017. ^ Connolly, Dan. "Manny Machado joins 20-20 club, carries Orioles to 6-4 win over Blue Jays". Retrieved March 18, 2017. ^ Connolly, Dan. "Manny Machado only player in MLB to play every game this season". Retrieved March 18, 2017. ^ a b "Manny Machado Stats". Baseball-Reference.com. Retrieved October 27, 2018. ^ "Manny Machado Stats - Baseball-Reference.com". Retrieved March 18, 2017. ^ "Orioles101 Mailbag: Baltimore Orioles' Roster Decisions, Manny Machado". sportsmedia101.com. April 24, 2016. ^ Ginsburg, David (May 8, 2016). "Machado hits 2 HRs as Orioles beat Athletics 11-3". The Associated Press. Archived from the original on August 28, 2016. Retrieved March 18, 2017. ^ "MLB suspends Yordano Ventura 9 games, Manny Machado 4 games for bench-clearing fight". Retrieved March 18, 2017. ^ a b Skrbina, Paul. "Manny Machado's 3 homers power Orioles past James Shields, White Sox," Chicago Tribune, Monday, August 8, 2016. ^ "Retrosheet Boxscore: Chicago White Sox 15, New York Yankees 4 (2)". Retrieved March 18, 2017. ^ "Retrosheet Boxscore: Seattle Mariners 15, Chicago White Sox 4". Retrieved March 18, 2017. ^ Meoli, Jon. "Orioles' Manny Machado ties team record with three home runs in three innings," The Baltimore Sun, Monday, August 8, 2016. ^ "Retrosheet Boxscore: Baltimore Orioles 9, Pittsburgh Pirates 2". Retrieved March 18, 2017. ^ Ghiroli, Brittany. "Manny Machado hits 470-foot homer over Monument Park". MLB. Retrieved April 28, 2017. ^ Lauber, Scott (2017-04-22). "Dustin Pedroia says he won't play 'baseball police' on Manny Machado slide". ESPN. Retrieved May 5, 2017. ^ Allen, Scott. "Dustin Pedroia says he had nothing to do with Red Sox throwing at Manny Machado's head". The Washington Post. ^ Bieler, Des. "Orioles' Manny Machado blasts Red Sox in profane rant after getting thrown at again". Washington Post. Retrieved May 5, 2017. ^ "Team Batting Event Finder: 2017, All Teams, Home Runs, Walk-off". Baseball Reference. Retrieved July 3, 2018. ^ Macklin, Oliver (January 30, 2018). "Machado shifting to shortstop, Beckham to 3B". MLB.com. Retrieved February 21, 2019. ^ Ghiroli, Brittany (May 24, 2018). "Manny Machado named to AL All-Star team". MLB.com. Retrieved October 27, 2018. ^ Gurnick, Ken (July 18, 2018). "Dodgers complete Machado trade with Orioles". mlb.com. Retrieved July 18, 2018. ^ a b Doolittle, Bradford (July 20, 2018). "Manny Machado hoping to fit in, win ring with Dodgers". Espn.com. Retrieved July 20, 2018. ^ "Machado shines in Dodger debut as LA beats Brewers 6-4". Espn.com. July 20, 2018. Retrieved July 20, 2018. ^ Rogers, Anne (August 9, 2018). "Machado notches 1,000th career hit". MLB.com. Retrieved August 10, 2018. ^ Gurnick, Ken. "LA wins 6th straight NL West title in tiebreaker". MLB.com. Retrieved October 1, 2018. ^ "Source: Dodgers' Manny Machado fined for running into Jesus Aguilar". ESPN. 2018-10-17. Retrieved October 19, 2018. ^ "Machado's 10-year pact with Padres official". Padres.com. February 21, 2019. ^ "O's Machado takes reps at shortstop for WBC". ESPN.com. Retrieved February 28, 2017. ^ "Manny Machado big fan of Players Weekend". MLB.com. August 25, 2017. ^ "United States puts away Canada early, advances to second round of WBC". Retrieved March 18, 2017. ^ a b c Zrebiec, Jeff (June 7, 2010). "Orioles select Machado with No. 3 overall pick in MLB draft". The Baltimore Sun. Archived from the original on June 16, 2012. Retrieved August 16, 2010. ^ "Manny Machado » Statistics » Batting - FanGraphs Baseball". Retrieved March 18, 2017. ^ Boeck, Scott (May 29, 2010). "Draft diary: For Manny Machado, shades of A-Rod". USA Today. Archived from the original on August 12, 2012. Retrieved August 17, 2010. ^ Zrebiec, Jeff (June 5, 2010). "Draft 2010: Machado compared to Rodriguez". The Post-Gazette. Archived from the original on October 20, 2012. Retrieved August 16, 2010. ^ "Orioles' Manny Machado quietly enters debate over MLB's best young player". The Washington Post. May 26, 2013. Archived from the original on June 15, 2013. Retrieved August 21, 2013. ^ Meoli, Jon (November 25, 2014). "Manny Machado appears to have married his longtime girlfriend, Yainee Alonso". The Baltimore Sun. ^ Axisa, Mike (February 24, 2011). "Machado, Alonso & Valencia Hire Dan Lozano". MLB Trade Roumors. Retrieved February 19, 2019. Wikimedia Commons has media related to Manny Machado.